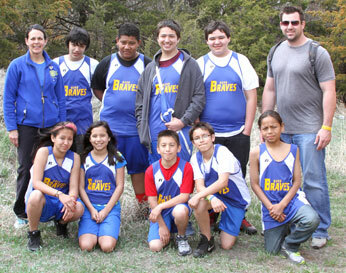 Our sixth, seventh and eighth-grade students were able to represent St. Joseph’s Indian School in their first track meet of the year on Monday, April 29. We do not have official results; however, we brought home seven ribbons between eight kids! Bryan looks on as Craig makes his throw. It is always a learning experience for the rookies. We called to have shoes, lunches and water sent to the field for those who did not realize how important these necessities are to pack or ask their houseparents to pack for them. 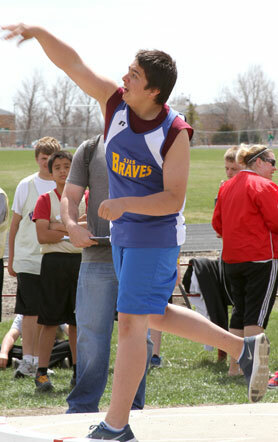 We have several Lakota boys throwing the shot put and discus. Our Recreation Center Director is an old hand at this, so Bryan is a great role model and motivator for these boys. Our Native American Studies teacher, LaRayne, stresses the important of endurance when it comes to running your hardest, giving your best and finishing the race with a smile. At the end of the day, we had some tired, but smiling, happy kids who were glad that our South Dakota spring weather cooperated so that we could showcase our talent to those outside of St. Joseph’s Indian School. 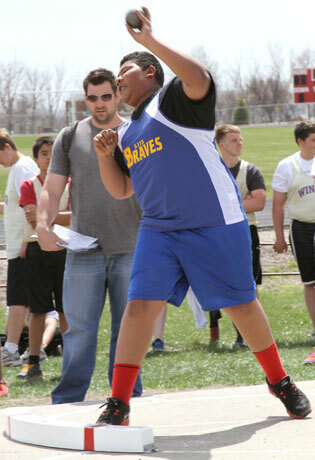 Anthony lets the shot put fly. congratuations!!!! Keep up the good work with good practice! !